Ms. Silcock has more than 25 years of experience advising companies on M&A, equity and debt capital market transactions, private debt and equity placements, and high yield offerings for growth-oriented companies across industries. She joined Houlihan Lokey in March 2009 to expand its client coverage through her broad and deep relationships with CEOs and business leaders. 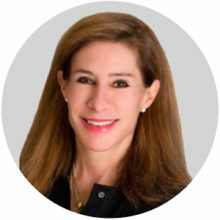 Before joining the firm, Ms. Silcock was Founder, Managing Director, and Head of Southwest Investment Banking for Citigroup Global Markets Inc. from 2000 to early 2009. From 1997 to 2000, she was a Managing Director with Donaldson, Lufkin & Jenrette’s Investment Banking Practice in Dallas, where she executed the full range of transactions for clients across industries. From 1989 to 1997, she was a Senior Managing Director at Bear Stearns & Co. in Dallas, where she focused on growth-oriented companies. Ms. Silcock began her career at Credit Suisse Group in New York in the Mergers and Acquisitions Group. She currently sits on the Board of OSG, an NYSE – listed company, and is a member of Women Corporate Directors (WCD), an organization of women who serve on public company boards. She remains active with both Princeton and Stanford, and is on the Board of the United States Ski and Snowboard Association, which supports Olympic athletes. She was formerly on the Boards of Mesa Airlines, a publicly traded airline, and Greenhunter Energy, a publicly traded water reclamation company. Ms. Silcock received her MBA from Stanford University and her B.A. from Princeton University.